The Animal Legal Defense Fund’s National Justice for Animals Week is an annual event dedicated to raising public awareness about animal abuse, how to report it, and how to work within your community to create stronger laws and ensure tough enforcement. Each year’s event features seven days of actions, and a representative – an animal whose experience with the justice system helps illustrate the law’s power to do more for animals. The annual week of awareness is capped off with the announcement of America’s Top Ten Animal Defenders – the list of top prosecutors, law enforcement officials, lawmakers and others who champion the cause of animal crime victims. Justice the horse is the representative for the Animal Legal Defense Fund’s National Justice for Animals Week 2019. The Animal Legal Defense Fund has brought a groundbreaking lawsuit on Justice’s behalf — that, if successful, will be the first to establish that animals have a legal right to sue their abusers in court. At the time of his rescue in March 2017, Justice, who is eight years old, was suffering from starvation, frostbite, and other grave injuries due to his former owner’s failure to provide him with basic care — including food and shelter. The horse was 300 pounds underweight, weak, and had a difficult time walking. Justice’s abuser pleaded guilty to criminal animal neglect in 2017. But she agreed to pay restitution only for the cost of Justice’s care prior to July 6, 2017. Our lawsuit seeks damages for Justice’s care from this date and forward. The funds will go into a trust to pay for Justice’s ongoing needs. Justice is now being well cared for at Sound Equine Options, an Oregon nonprofit horse rescue and rehabilitation organization. Because of his injuries and the expense of caring for him, it has been hard to find him a permanent home and a family of his own. One big hope is that this lawsuit will help, in that regard. Another is that this lawsuit will bring about some progress in the law, so the legal status of animals matches what we as a society already recognize: they are sentient beings with their own lives and interests, and they deserve our respect. There are seven actions you can take—one for each day of the week. Be prepared. Know what to do when you witness animal cruelty. Familiarize yourself with your state animal protection laws. Sign up for Action Alerts so you can take action on national and local animal issues. Don’t just read the news—make it! Write a letter to the editor about an issue involving animals in your area. Connect with the Animal Legal Defense Fund onFacebook,Instagram and Twitter. Share this page with #NJFAW, #Justice4animals and #aldf! Join the Animal Legal Defense Fund Student Chapter at your law school. Chapters are encouraged to host events to raise awareness about criminal justice issues in animal law. Please see the list of suggested events and projects below. Table during lunch or class breaks (we can provide free materials!). Request them by February 3, 2019. Email or call your representative about pending local, state, or federal legislation. Check city and state government websites for current legislation, or contact us to see if there is pending legislation in your area. Organize an Animal Legal Defense Fund Benefit Day by contacting a local vegan/vegetarian restaurant or animal-friendly business to see if they would donate a percentage of their total daily sales to Animal Legal Defense Fund. Find more project ideas here. Ag-Gag legislation, which criminalizes whistleblowing of egregious animal cruelty on factory farms. Criminal anti-cruelty laws: an overview of the laws in your state or exciting legislative developments, or how certain animals like farmed animals are exempt from them. 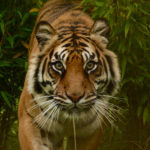 The connection between domestic violence and animal cruelty. The prosecution of animal cruelty cases. Your chapter can apply for a project grant to support your event. You can also receive a grant for a student chapter banner to use during National Justice for Animals Week and other chapter events. If your chapter has any questions, please contact the Student Programs Attorney. Get Involved in National Justice for Animals Week! How can Animal Legal Defense Fund Student Chapters get involved? Chapters are encouraged to host events to raise awareness about criminal justice issues in animal law, including how to report it, and how to work within your community to create stronger laws and ensure tough enforcement. David Partsch, Otoe County Attorney, Nebraska City, NE: In 2012, David Partsch successfully prosecuted a felony animal cruelty case involving hundreds of pigs left to starve to death. After sentencing, he worked with state legislators to strengthen Nebraska’s “possession ban,” a law which allows judges to prevent convicted animal abusers from owning animals in the future. The defendant from the 2012 case was again charged with cruelty in 2018, after goats and pigs were found starved to death on his farm. This time Partsch was able to point the court towards Nebraska’s improved law, securing a guilty plea from the defendant, and a livestock possession ban that could run as long as 75 years. Debbie Darino, Port Orange, FL: When a 9-month-old puppy named Ponce was beaten to death in Debbie’s community, Debbie drew on her experience as a legal assistant to identify where Florida’s animal protection laws could be strengthened — then rallied citizens and lawmakers to support legislation that came to be known Ponce’s Law. 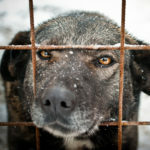 Ponce’s Law allows judges to prevent convicted animal abusers from possessing animals, and expands the range of animal crimes that constitute a felony. The law went into effect on March 23, 2018 — National Puppy Day. 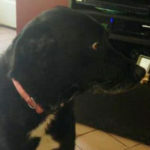 Dinwiddie County Sheriff’s Department and Dinwiddie County Animal Control, Dinwiddie, VA: In November 2018, the Dinwiddie County Sheriff’s Department and Dinwiddie County Animal Control seized 26 dogs from a suspected dogfighting operation. Thanks to these two agencies’ work, the Attorney General’s Animal Law Unit secured 37 animal cruelty and dogfighting convictions against Eldridge Freeman in December 2018. Jodi Whiting, Sheriff’s Deputy at the Polk County Sheriff’s Office, Dallas, OR: As Deputy Animal Control Officer for the Polk County Sheriff’s Office in Oregon, Jodi Whiting has dedicated her career to helping animals. Jodi has spent the past 15 years investigating egregious animal cruelty cases, and helping bring those who harm animals to justice. Kathleen O’Leary, Assistant U.S. Attorney, U.S. Attorney’s Office, District of New Jersey, Newark, NJ: Operation Grand Champion is a multi-state dogfighting network prosecuted by Assistant U.S. Attorney Kathleen O’Leary — one of the many cases in which she has pursued justice on behalf of the human and animal victims of federal crimes. This case is also a legal milestone, as O’Leary successfully argued to the trial court that the dogs involved in this case were themselves crime victims — and that the defendant who trafficked them needed to be held accountable for each of his animal crime victims at sentencing. Kim Koon, Director of Investigations and Rescue Operations for Pasado’s Safe Haven, Sultan, WA: Under Kim Koon’s leadership, Pasado’s Safe Haven partners with law enforcement agencies and prosecutors to provide boots-on-the-ground assistance in approximately 250 cases of animal cruelty each year. Kim also organizes trainings for law enforcement, animal control, and prosecutors from around Washington state to help improve the criminal justice system’s response to animal crimes. 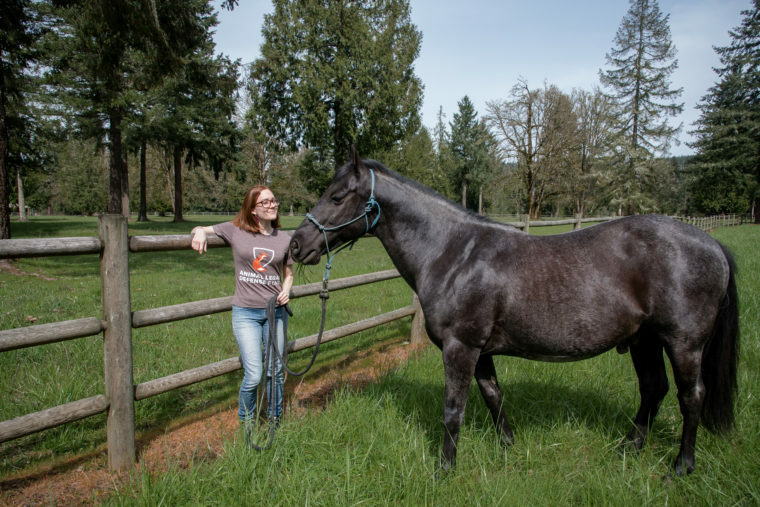 Kim Mosiman, Executive Director of Sound Equine Options, Gresham OR: Kim Mosiman, executive director of Sound Equine Options, has spent the last decade providing care and rehabilitation for abandoned, neglected, and abused horses in the Pacific Northwest. Over the past year, Sound Equine Options has been home to Justice, a horse whose former owner pled guilty to severe neglect that left Justice with permanent medical needs. As his guardian, Sound Equine Options has been critically supportive of Justice’s ongoing legal effort to sue his former owner for the restitution he is due. Justice is the representative for National Justice for Animals Week 2019. Representative Louis Kafka, Senator Bruce Tarr, and Senator Mark Montigny, Boston, MA: Representative Louis Kafka, Senator Bruce Tarr, and Senator Mark Montigny all sponsored a bill in the Massachusetts State Legislature to strengthen the state’s animal protection laws. The Act to Protect Animal Welfare and Safety in Cities and Towns — known as the PAWS II Act — contains important animal protections which helped Massachusetts become one of the “most improved” states of 2018. Representative Kafka was also instrumental in the passage of the Act’s predecessor, PAWS, in 2014. Representative Patricia Serpa, West Warwick, RI: Representative Patricia Serpa was elected to the Rhode Island House of Representatives in 2006 and has been a steadfast advocate for animals ever since. In 2018 Serpa sponsored two successful animal protection bills: The first made it illegal for hunting dogs to be left outside in frigid weather (previously, the law barring dogs from being kept outside in extreme weather exempted hunting dogs). The second banned battery cages for egg laying hens. In the 2019 session, Representative Serpa plans to introduce legislation banning the retail sale of puppies and kittens. Willow & Stormy are the representatives for the Animal Legal Defense Fund’s National Justice for Animals Week 2018. They were victims of severe neglect, both pregnant and severely malnourished when law enforcement found them. They were lucky to survive, but, thanks to the great work of the prosecutor and local rescuers, today Willow & Stormy are thriving, as are their foals. And their abuser is behind bars. 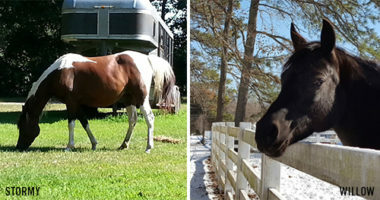 The prosecutor knew how important it was to win justice for Willow, Stormy, and the other horses — so she contacted the Animal Legal Defense Fund, and we provided support to ensure that key witnesses were available to testify in this important case. Every year countless animal victims endure criminal cruelty. Willow & Stormy remind us that with persistence, we can make sure more animal abusers are brought to justice. The abuser has received 2 years in jail from the jury and a probation revocation. She has been prohibited from owning, possessing and caring for horses for ten years. She is a repeat offender for abusing horses so it was incredibly important to bring her to justice. In 2017, our representative for National Justice for Animals Week was Luke the pit bull. Luke is in a loving home today, but it was a hard fight to get him there. When Luke was just a puppy, he suffered a painful shattered shoulder when his guardian allegedly threw him against a wall. The owner was acquitted of cruelty charges in court, but the prosecutor didn’t want to return Luke to a dangerous situation and contacted us. The Animal Legal Defense Fund stepped in and developed a creative legal strategy that allowed Luke to be adopted out into a safe and loving home. Each year the criminal justice system fails animal victims of abuse, and Luke is a great example of how we can make the laws work to protect animals. 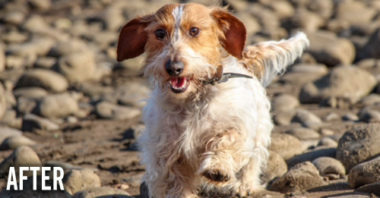 In 2016, our representative for National Justice for Animals Week was Baxter, a four-year-old silky haired dachshund. The Oregon Humane Society (OHS) rescued Baxter from an Oregon puppy mill, after which he became known only as Count 26 in the resulting animal cruelty case. 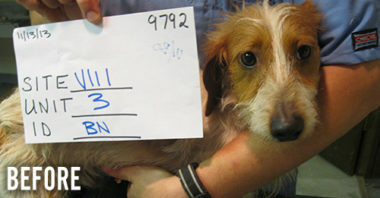 When Baxter went to his foster home, he was so matted and dirty that it wasn’t clear what kind of dog he was. 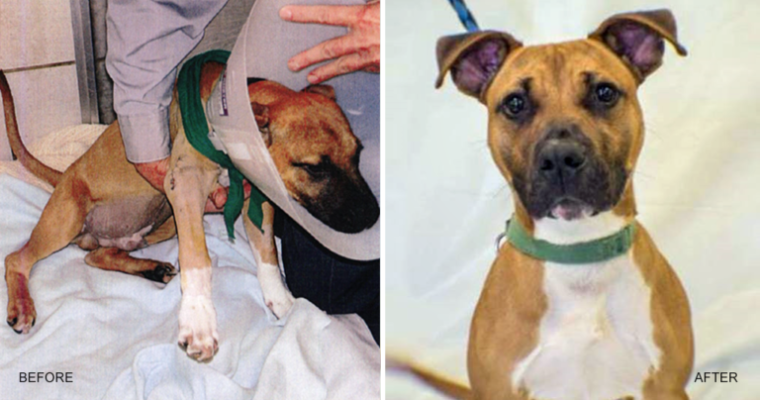 But Baxter, like all animals, was resilient and came a long way since rescue. He learned that people can be kind, loving, and fun. He revels in the comforts of home. He’s a great example of how far a neglected animal can come with proper care and a little love! Gracie was our representative for 2015’s National Justice for Animals Week. 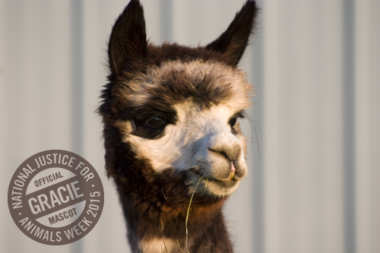 This sweet alpaca was neglected and severely emaciated when she was rescued from an alpaca farm in Oregon. Thanks to Cross Creek Alpaca Rescue she has since made a full recovery and is thriving in her new home.